Camping in the cold can be a challenge, but with the right gear and preparation, even the coldest nights can be enjoyable. When temperatures drop and snow falls, campsites become much less crowded. The fear of being cold keeps even avid campers bundled up indoors on winter nights. But there is no reason to lock yourself inside all winter. 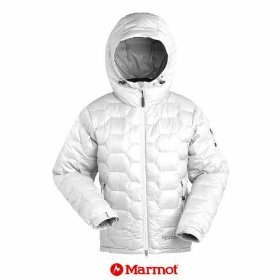 With the right gear, any winter trip can be fun and comfortable. When it comes time to curl up and close your eyes, the sleeping bag is responsible for keeping you toasty. Because of this, it is important to use a quality sleeping bag rated for the expected temperature. The temperature ratings assigned to sleeping bags are approximations, but it is worth choosing one at or below the temperatures you expect (or fear) on your trip. When sizing a winter sleeping bag, it is important to err on the side of roominess. You don’t want it to be huge, but allow enough room for extra layers and stashing things, like extra clothes, water bottles, and batteries. Choosing between natural down and synthetic fill is often a matter of personal preference. One important consideration, however, is climate. Synthetics do much better in wet environments, like winter in the Northeast, while natural down is better suited to places with a dry winter, like Colorado. When it comes to down sleeping bags, no one makes them better than Feathered Friends, a company based in Seattle, Washington. If you prefer synthetic, Mountain Hardwear is the standard among mountaineers. Note: You will sometimes hear people claim sleeping bags keep you warmest if you crawl in naked or wearing a single thin layer of clothing. This is simply not true. While you don’t want the fill of the sleeping bag to be compressed, physics tells us that the more layers of insulation you have around you, the warmer you will be. After a sleeping bag, the piece of gear that will help keep you warm at night is your tent. 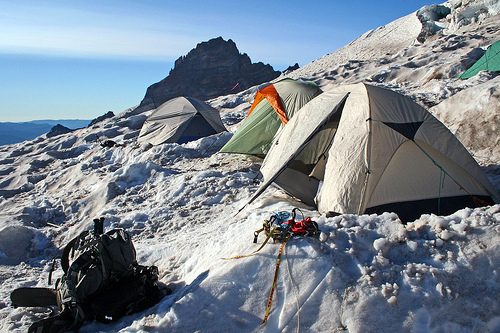 Most people use four season or “expedition” style tents for winter camping. The major difference from summer tents is that winter tents have much less ventilating mesh. 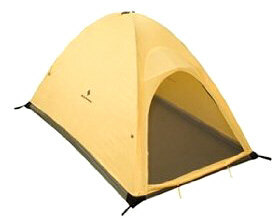 Expedition tents generally feature extra guy-lines, stronger poles, and sturdier fabrics to battle extreme winds. Both the Mountain Hardwear Trango 2 and the North Face Mountain 25 have been expedition and winter camping standards for years. One alternative to these classics is a single-wall tent. These tents are made from waterproof and breathable fabrics so they don’t require a separate fly. They are extremely warm, easy to set up, and durable. If you are serious about winter camping, it is worth checking out the Firstlight from Black Diamond. With the right tent and sleeping bag, you will be warm in bed, but to stay warm when you’re just standing around, you need a big puffy coat. The idea here is to choose something large enough to fit over all of your layers whenever you stop moving or are doing small things around the campsite. 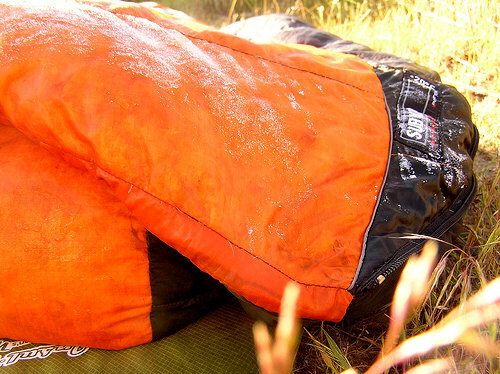 The choice between natural down and synthetic fills is the same here as it is with sleeping bags: synthetic is the better choice for wet or damp climates. 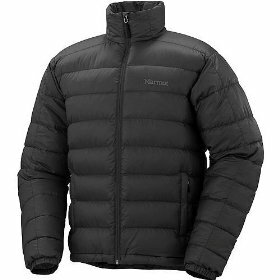 If you are a fan of down, the North Face Nuptse Jacket is a classic, however, because I strongly recommend a jacket with an insulated hood, I think the Frontpoint Jacket from Feathered Friends is a better choice. If you are looking for a synthetic jacket, you can’t go wrong with the popular DAS Parka from Patagonia. My personal favorite, however, is the Belay Jacket from Wild Things. I used to think my summer backpack was huge. Then I tried to stuff a winter-weight sleeping bag into it. After an hour of wrestling with what looked like a giant, fluorescent, sausage I realized that even if I crammed everything inside my now small-looking backpack, there was no way I could repack it in the cold and snow. 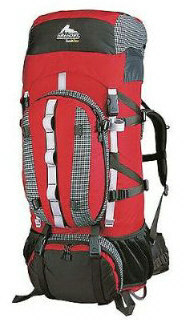 The lesson: winter gear is massive and you need a giant backpack to contain it all. Good choices for a winter-sized pack include the Denali Pro 105 from Gregory Packs, the Argon 110 from Osprey, and the truly enormous Astraplane from Marmot. Campfires are great in the summer but they confuse your body’s internal thermometer in the winter and are best avoided. 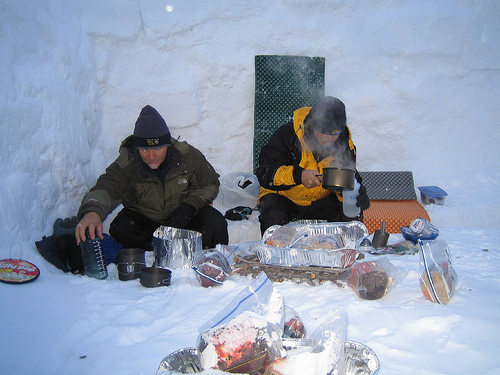 This leaves the camp stove as the only way to cook food, melt snow for water, and brew hot drinks. All three of these things– lots of water, warm food, and warm drinks– are absolute necessities for staying warm in the winter. When picking a winter stove, you want to choose one with the highest output possible. Another consideration is the fuel type. Stoves that use pressurized fuel canisters are convenient in the summer, but the fuel has trouble staying gaseous in the cold. The more reliable choice is a stove that uses liquid fuel, most commonly white gas. 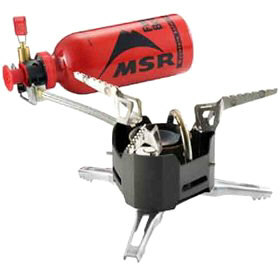 The WhisperLite from MSR is a good, popular, choice, but you cannot match the incredible XGK EX when it comes to durability or heat output. 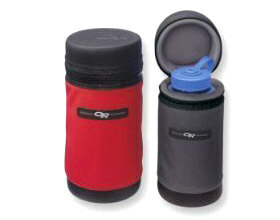 It seems like a frivolous thing: a big, zippered, coozie for your water bottle. In the summer, it probably would be. But keeping your water liquid when the ambient temperature is below zero is not a simple task. Insulators, like the one from Outdoor Research, make it a lot easier. Another tip is to always store your water bottle top-down in the winter. This prevents the cap from freezing shut. 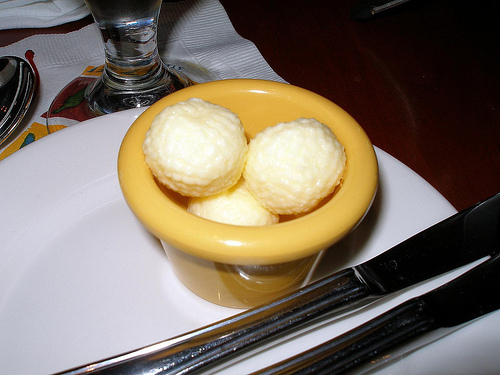 Laugh all you want, but an ample supply of butter is the best way to stay warm in the winter. Drop a tablespoon into your oatmeal in the morning, another tablespoon into your soup at dinner, and drink some hot chocolate with a tablespoon before bed. As unappetizing as this may sound, the calories and fat in butter are exactly what your body needs to stay warm all day and night. Camping in the cold can be a challenge, but with the right gear and preparation even the coldest nights can be enjoyable.